We all know many of the most popular Disney movies are based on fairy tale classics, but how much of these tales have been ‘Disneyfied’ for family-friendly ratings? 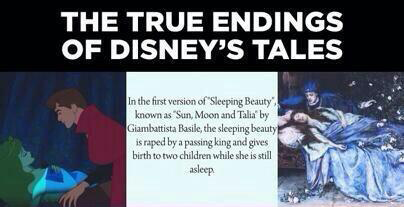 See below for the shocking stories behind your Disney favourites. If you know any other fairy-tale origins I would love to read them in the comments. This entry was posted in The Wider Disneyverse and tagged Beauty and the Beast, Disney, Movies, Sleeping Beauty, Tangled, The Little Mermaid. Bookmark the permalink. 1.Why is Elsa born with the special powers but Anna is “completely ordinary” (as mentioned by Hans) ? In the meeting with trolls the king says “she was born with the powers not cursed”. 2.How does the king know where to go when Elsa strikes Anna accidently? 3.Who are the King/Troll in the King’s book? – it seems like the trolls had saved someone in the family from “frozen head syndrome” before. 4.When the troll warns of Elsa’s power having dangers the King says – “she can learn to control it I’m sure” – what gives him this confidence. Why is he sure that Anna or others will not be in danger again? 5.How does he know that the gloves will help Elsa – even though other materials like shoes don’t block Elsa’s icy powers? When she runs through the fjord and freezes it. Here is my theory: Many hundreds of years ago when a drop of sun fell on the Earth, the magic flower bloomed with healing powers. Around the same time the force of the wind and water combined far way in Arendelle and gave rise to a magic ice crystal which was likely acquired by Arendelle’s King to gain magical powers. However, this power was not controlled and resulted in at least one example of frozen head syndrome and the troll helped. Since then the family did not disclose the powers to anyone. The powers subsequently passed on to descendants, sometimes skipping a generation. It is likely Elsa’s father had seen someone in the family with these powers and that’s how he knows how to help and Elsa inherited these powers. This also ties in to why everyone in Rapunzel’s kingdom starts searching for the magic flower when the queen is ill. If Rapunzel’s mom is the sister of Elsa and Anna’s dad then it is very likely that she or her brother might have asked for a search of the magic source – having known of the ice crystal and its power. That also explains why the healing powers was acquired by Rapunzel and stayed strong in her tears with her even though her hair was cut. However these powers are not exclusive to just Elsa and Rapunzel – there are other magical creatures who are able to harness the powers of nature – The Ice Trolls, King Triton – King of Mermaids/other magical characters confirm that other creatures are able to harness these powers but humans can only do so in extremely rare circumstances. King Triton and probably other sea creatures like the sea witch Ursula possess varying degrees of water power. Pabee the magical Troll ( or rock creature) possesses the Healing/Life giving power of Earth as did some of his ancestors (if he isn’t several hundred years old and was the troll in the King’s book). This brings me to the more exciting part of my theory. It is very likely there will be two more Disney princesses with powers. We have had two as of now – Rapunzel the princess with the healing and restorative power of Magic flower which was born when a drop of the Sun (Fire) fell on the Earth. The second magical princess is Elsa, with the power of the magic ice crystal born of the cold air (Wind) and Mountain Rain (Water) combining (as alluded to in the Frozen Heart song). Rapunzel has the power of restoration/life and represents Earth, Elsa wields the beautiful but deadly power of water. The next two princesses will have the powers of the Wind and Fire. And another reader commented that Disney has already announced their next princess Moana ( to be released in 2018) as a Polynesian princess and this confirms the Earth, Water, Fire & Wind Theory. The South Pacific is the spirited/mystical meeting ground of Fire and Water – where Lava flows into the ocean (Fire goddess Pele is an example of the folklore). Moana is the Princess with Fire Power. I would suggest another theory. The four elements had already came together after Frozen, and according to the Frozen theory all four princesses share the same world. As you suggested, Rapunzel holds Magic of Earth. The drop of sunlight does not represent fire, but instead represents growth and healing, and manifested itself as a flower grown from earth. Elsa holds Magic of Wind. This best explains her icy magic and ability to start storms with her sheer will. The Magic of Water, however, is held by Ariel, the little mermaid. She is born a mermaid. The Magic of Fire, I think, is held by Anna, I think. In the movie, despite frozen everywhere else, the place trolls lived are still warm with a steady geothermal heat supply. When rand Pabbie healed Anna he gave her some of that Magic of Fire to fend herself off Anna’s icy powers. This power manifested itself as the super strength Anna displayed throughout the movie. Elsa freezing her head (and subsequently her heart) actually prevented Anna’s fiery powers from fully manifesting itself. The elements theory could be true but in this case I think that only Rapunzel and Elsa are concerned (and maybe Anna but that might be explained in Frozen 2). I don’t think the little mermaid has anything to do with elements because the movie is too old to be part of this. Indeed, why the productors would have waited so long before making an other princess with element powers between Ariel and Rapunzel (almost 30 years) when there are only 3 years separating Rapunzel from Elsa? This wouldn’t make any sense. Moreover Ariel isn’t human from the start like you said. She was born a mermaid but has no specifical powers if you compare her to the others of her kind, whereas Rapunzel and Elsa were born with powers. Rapunzel gained hers because her mother drank a cure made from the magical flower while pregnant. What if Elsa’s mother had done the same or at least if something similar happened before in the family (so that it would explained why they seem to already know how to handle it)? 1) If something happened to Elsa’s mother during her pregnancy, it would explain why she has powers but not Anna and if she turns to have magical powers it could in fact be caused by Pabbie. However if she really has those I doubt it could be compared to Elsa and Rspunzel’s powers and that it would be the magic of fire. 2) An other theory would be that someone already had powers in their family somehow (who kows what would happened if Rapunzel had a child of her own? It might be hereditary) but it doesn’t come out every generation or maybe it does but the powers need something to be awakened by some trigger. That would explained why Anna doesn’t have powers (at least not yet). So about Anna I don’t know if she has powers and if they would be connected to elements but I’m sure that if the elements theory turns out to be true then there’re 2 elements that still have to appear (fire and water or earth and water depending which one Rapunzel already has). Don’t Forget about The Hunchback of Notre Dame ending. Everyone pretty much dies at the end of that book. Phoebus doesn’t actually fall in love with Esmeralda either, it’s pretty much a one night stand and he leaves her to die on the hangman’s noose after being framed for his attempted murder. Sad tale actually. 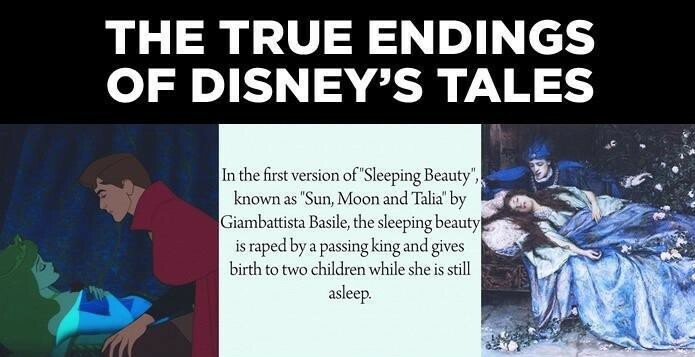 But there is a different Disney ending for you. In a version of the Snow Queen (Story that Frozen is based on) that I read, it begins with a troll flying above the world with a mirror that makes everthing look ugly. He then drops the mirror, and shards fly all over the world. One shard flies into Kay’s (Best friend of Gerda, Kay is a boy) eye and he begins to become a nasty little brat. The Snow Queen takes him to her palace. Gerda (girl) searches for her friend and goes to a bunch of castles until she finds the Snow Queen’s castle, where Kay is frozen solid in the jail. Gerda starts to cry and makes a heart out of some ice shards on the floor and a tear drops onto this heart and Kay thaws and they begin to run away. Just as they were about to get out of the castle, though, the Queen appears and spears them through the heart with ice. Yeah. Another version I read is just like that minus the mirror shard (instead the Queen puts a shard of ice in his eye) and without the last sentence. 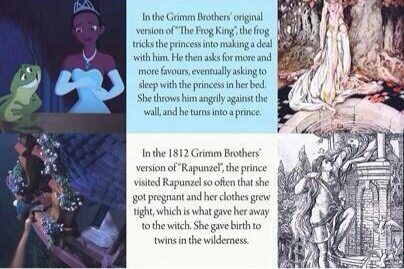 I’ve read all of the Grimm & Anderson fairytales and these are just a few differences that I’ve found in the versions I’ve read, which according to the books are original translations, but I could be wrong. About the Rapunzel ending. Dame Gothel knew that Rapunzel had been seeing the prince at night not because her clothes grew tighter, (in fact the story never mentions her pregnancy at all, until the end where it says she has given birth to the twins), but because Rapunzel slipped up massively and asked the witch “how it happens that you are so much heavier for me to draw up than the young King’s son – he is with me in a moment.” That’s how the witch knew. Then she did the whole cutting the hair off thing and threw Rapunzel into the desert, before tricking the prince into climbing the tower, where she tells him that Rapunzel is gone. He then jumps from the window, escaping with his life, but piercing his eyes in the process, in a thorn bush at the base of the tower. He then wanders the wilderness in despair, where he follows a voice he recognises (Rapunzel) and she heals his eyes with her tears, much like how Rapunzel in the Disney movie saves Flynn at the end. And the tale randomly mentions at the end that they were already married, even though all we know is that he proposed. The Grimm version of Sleeping Beauty is much like the Disney movie, with a lot less action & basically a lot less everything. She falls asleep for a hundred years & a prince comes at the end of it & kisses her for no reason other than she was beautiful, even though she was about to wake up anyway. No dragon or Maleficent (other than the witch who cursed her). Just one more thing, in the Grimm tale of Snow White, it is the stepmother who tries to kill Snow White, because her actual mother really wanted a baby ‘as white as snow, as red as blood, and as black as the wood of the window-frame’ after she pricks her finger sewing and a drop of blood falls out of the ebony window frame at which she is sitting and falls into the snow below. and it says that ‘when the child was born, the Queen died.’ and then it mentions that the King took a new wife. Actually, the Grim Brothers gathered the different fairy tales from different parts of the world, they didn’t write them. Actually the witch in Snow White is Snow’s stepmother. And the poisoned Apple bit was dislodged when the Prince decided to take Snow White. The original ending to The Little Mermaid? Tragic. The mermaid’s heart is broken after the prince married someone else (someone who he thinks actually saved his life and not the mermaid who saved him). So, since the mermaid gave up her voice to the Sea Witch for legs and cannot be a human forever, the mermaid turns into sea foam and dies. Harsh. I find Disney’s Little Mermaid much more entertaining. Also, the original ending to The Frog Prince. In one version, it is not the princess’s kiss that changes the frog into a human. It is after she angrily throws the frog against the wall and he is supposedly dead. Then, he changes from a frog into a prince and they get married. Sorry for my previous post about the un happy endings. Just re read the article and found the Frog Prince and Little Mermaid. Still, very different from Disney. In snow white the wicked step mother pretends to be the evil witch and first tries to get snow white into a course which is tied too tight and causes snow white to become unconscious until the dwarfs return and loosen, then the Apple becomes lodged in windpipe which causes her death and isn’t until the Prince shifts her glass coffin that the Apple dislodged and snow white wakes. 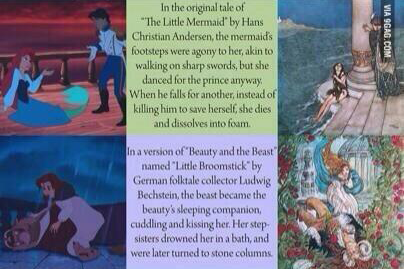 In the original Little Mermaid, the mermaid dies because the prince falls in love with another woman. Her sisters beg the Sea Witch for another chance. The Sea Witch gives the mermaid a knife; if she stabs the prince with the knife on the eve of his wedding, she can return to being a mermaid. However, the little mermaid loves the prince so much she doesn’t kill the prince. She returns to sea foam. Another variation of Cinderella: The King’s wife dies and he swears he will never marry again unless he finds a woman who fits perfectly into his dead Queen’s clothes. Guess what? His daughter does! So he insists on marrying her. Ew. Understandably, she has a problem with this and tries to figure out how to avoid wedding dear old dad. She says she won’t marry him until she gets a trunk that locks from outside and inside and can travel over land and sea. He gets it, but she says she has to make sure the chest works. To prove it, he locks her inside and floats her in the sea. Her plan works: she just keeps floating until she reaches another shore. So she escapes marrying her dad, but ends up working as a scullery maid in another land”¦ from here you can follow the Cinderella story. She meets a prince, leaves her shoe behind, he goes around trying to see who it belongs to. The End.